BELLINGHAM, Wash. (AP) — Two Boy Scouts and two troop leaders spent a night inside a cave high up Mount Baker in Washington state before they were rescued and taken to a hospital with hypothermia, officials said Monday. The four sought shelter in the cave on the 10,781-foot (3,286-meter) peak after they became separated from other members of their troop, the Whatcom County Sheriff’s Office told KING-TV in Seattle. The four were reported missing Sunday, and a search began that afternoon. A six-member search and rescue crew from the U.S. Navy’s Whidbey Island station landed a helicopter on the summit Monday morning and flew the climbers to a hospital, the Navy said in a news release. The 13-year-old boys and two adults were treated for hypothermia, the TV station reported. Authorities did not identify them. A man, a woman and two boys were in serious condition Monday at PeaceHealth St. Joseph Medical Center in the city of Bellingham near the peak, spokeswoman Hilary Andrade told The Associated Press. She said they will be transferred soon to another facility but declined to say where, citing patient privacy. 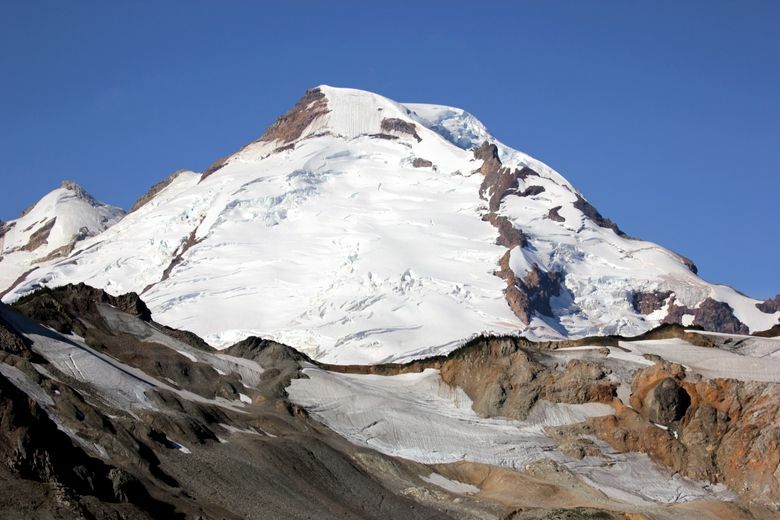 Mount Baker is about 15 miles (24 kilometers) from the Canadian border, and all climbing routes up the snow-capped peak in the Cascade Mountain range are technical climbs on glaciers with varying degrees of difficulty. Two adults and two 13-year-old boys were using a popular route on the peak’s north face, sheriff’s Deputy Mark Jilk, who helps manage search and rescue operations, told the Bellingham Herald. Navy Lt. Chris Pitcher, search and rescue mission commander, said in a statement that weather, wind and high altitude made it one of the most challenging rescues he’s been on.